The sun has been quiet for the past couple of years. Too quiet. Normally, our home star goes through a sort of rising and falling sleep-wake cycle that lasts 11 years, on average. At the so-called solar maximum, magnetic storms roil its outer layers and sunspots dapple its surface; solar flares arc magnificently into space; and clots of charged particles spew outward in bursts of plasma that can reach to Earth and beyond. At the solar minimum  the stage we've been experiencing lately  all of that drops off dramatically. The recent solar minimum has been unnaturally calm, though, with literally no sunspots at all for extended periods, and the eerie silence has gone on for about two years  about twice as long as the typical minimum. "People began to get nervous," says solar astronomer Leon Golub, of the Harvard-Smithsonian Center for Astrophysics, "that the sun would never come out of it." But on Aug. 1, the sun woke up with a vengeance: there was, in the breathless words of the website SpaceWeather.com, "a C3-class solar flare, a solar tsunami, multiple filaments of magnetism lifting off the stellar surface, large-scale shaking of the solar corona, radio bursts, a coronal mass ejection and more." The event was captured in spectacular video by NASA's new Solar Dynamics Observatory, launched in February. For the average person, it's the mass ejection that's most immediately relevant. A giant solar burp has sent a cloud of charged particles racing toward Earth. When the particles, which were predicted to arrive on Tuesday night, slam into Earth's magnetic field, the resulting electromagnetic storm is likely to trigger a spectacular show of northern lights across Russia, North America and northern Europe. It could also scramble communications between orbiting satellites and receivers on Earth, but the relatively modest size of the ejection has led experts to consider a major disruption unlikely. Still, says Golub, "we have no way of predicting this with any certainty." Solar physicists also haven't got a good handle on why the sun sometimes goes quiet for extended periods. The most recent episode happened about a century ago, but back in the 1600's and early 1700's, the sun sank into a dead calm, known as the Maunder Minimum, that lasted for decades. At its lowest ebb, sunspot activity was about 0.1% of normal for some 30 years. As it happens, the Maunder Minimum overlapped a period called the Little Ice Age, a time when the Thames River routinely froze over in winter and widespread famines, due to shorter, colder growing seasons, affected much of Europe. That coincidence has led to suggestions that reduced levels of solar energy caused the Little Ice Age  and indeed, a slight dimming of the sun does go along with solar minima. But it isn't enough to explain such a dramatic change in climate, and, says Golub, "the timing isn't quite right. The cooling started before the sunspots went away." The same is true today. 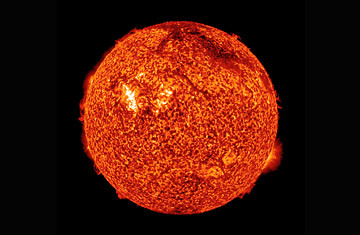 Solar variability can account for about 10% of the variability in worldwide temperatures, says Golub  which means that even if we were entering a modern-day Maunder Minimum, it wouldn't be remotely enough to counteract the warming effect from increasing levels of greenhouse gases. And despite the sun's newfound wakefulness, we could well be entering another long period of reduced activity. "There are predictions," Golub says, "that the coming solar maximum will be a weak one." That's how it began last time: the peaks of solar activity got weaker and weaker, and then they went away altogether for 30 or 40 years. Or maybe this is just a false alarm. "People are predicting all the possibilities you could imagine," he says. "Somebody's going to end up being right." See more on the solar tsunami.